Remember this photograph from my last post, well here is my tour of General Salvage as promised. What can I say, I love General Salvage. There is so much in this place to look at. When I go there I try to keep an open mind, forget what the items are used for because anything can be turned into something else. 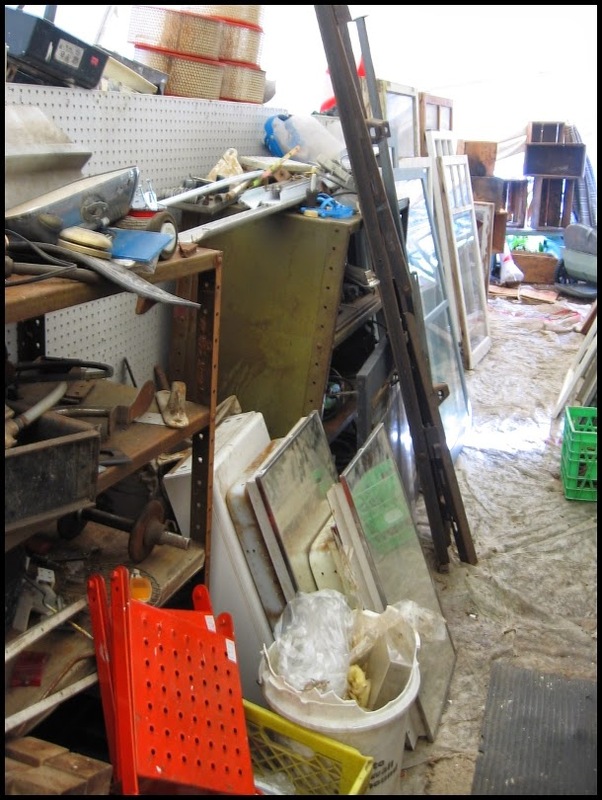 Before I forget, General Salvage is in the basement of Jacklin Trading Post. The upstairs is crammed with antiques. If you plan to visit, spend an entire day or do it over several days so that you don't go into overload shock mode! I must apologize for some of the out of focus photos. I have tried to bring them into focus as much as possible with my image editor program but a bad photo is just a bad photo. There are small alcoves that have items for specific needs. 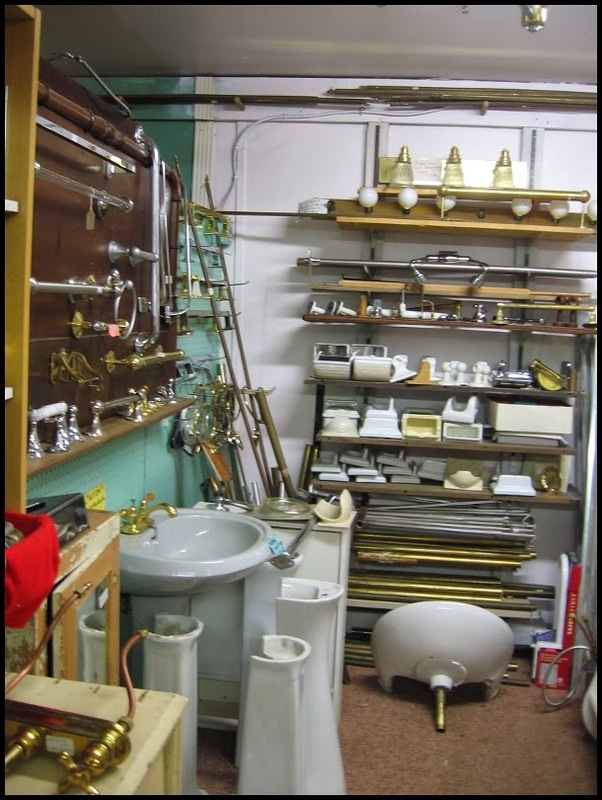 This alcove has vintage and antique plumbing fixtures and bathroom accessories. The variety of lamp fixtures is amazing. Once the fellow wouldn't sell me an embossed die-cut brass ring for holding a glass oil lamp shade because I said that I was going to cut it apart to be used in some of my sculptural pieces, evidently they are hard to find. I appreciate that very much, I have some items that I just cannot cannibalize for that reason. This aisle is a real treat to browse through. 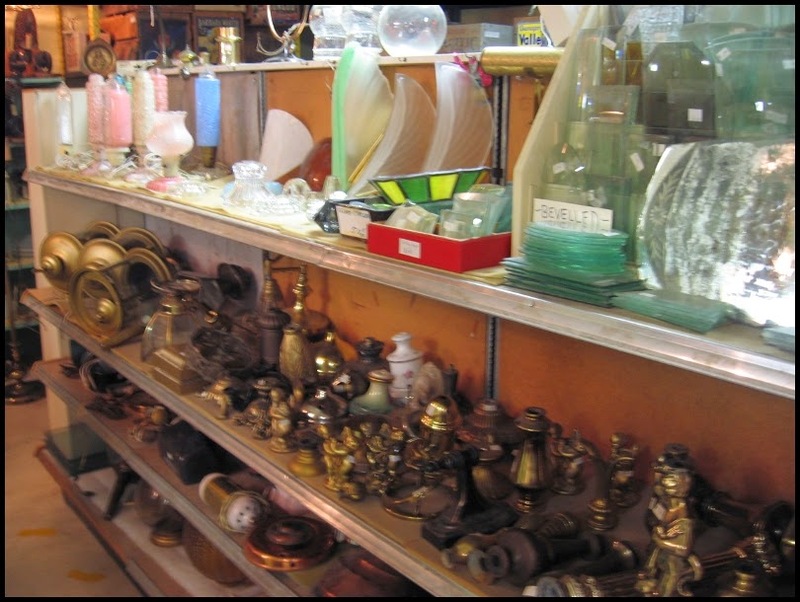 On the right side of the picture are metal parts from vintage and antique lamps to be reassembled into your own creation. 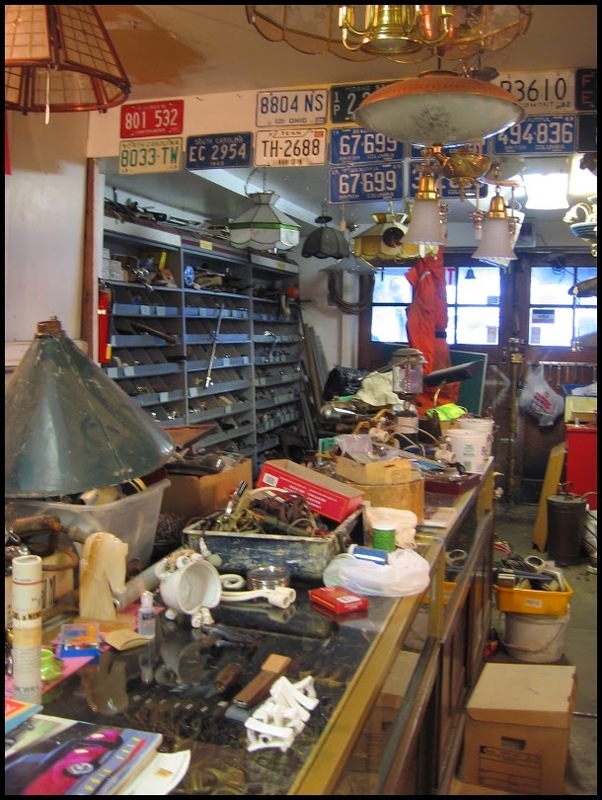 Some of those lamp parts are from gas lighting fixtures. There are cabinets with thin sliding trays that are filled with hinges and anything else that you may or may not be looking for. 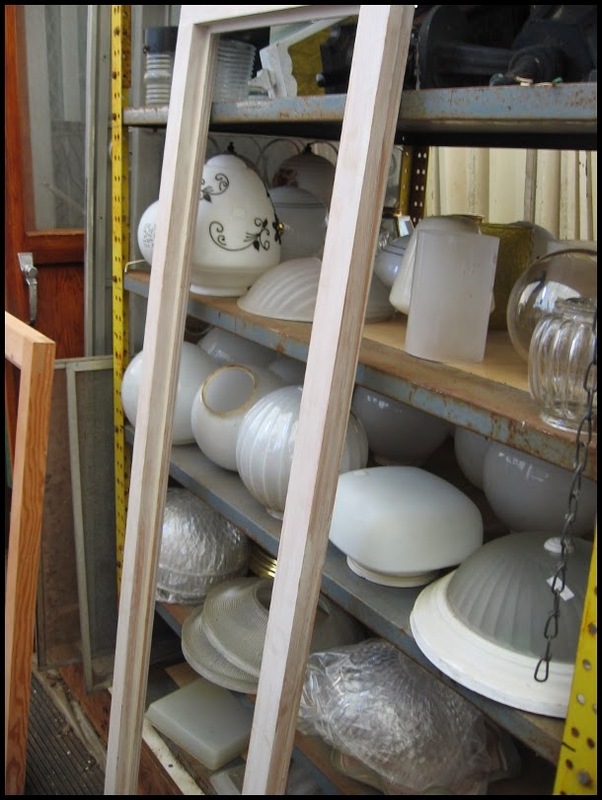 On the top shelf there are glass panels from damaged glass lamp shades, pastel frosted glass boudoir shades and Art Deco wall sconce shades. 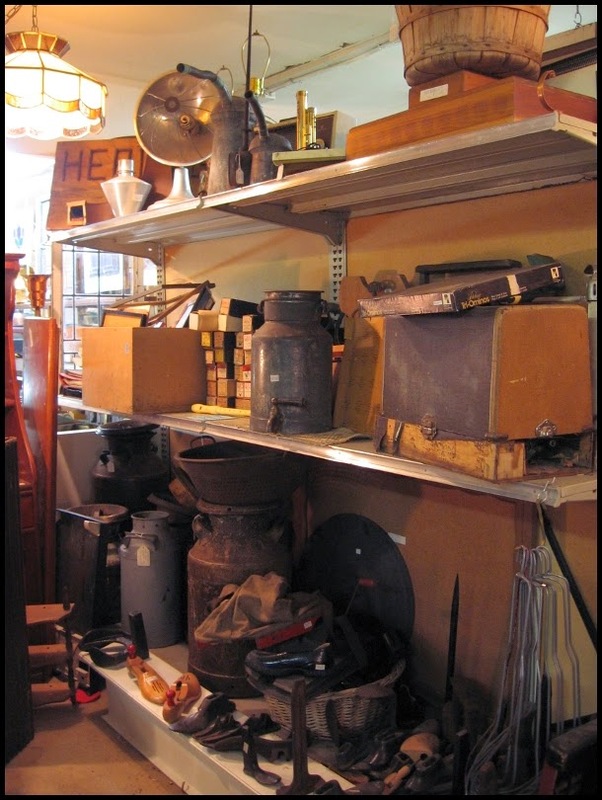 The middle shelf has all kinds of vintage lamp base parts. This area has banister spindles and salvaged pieces from broken chairs. 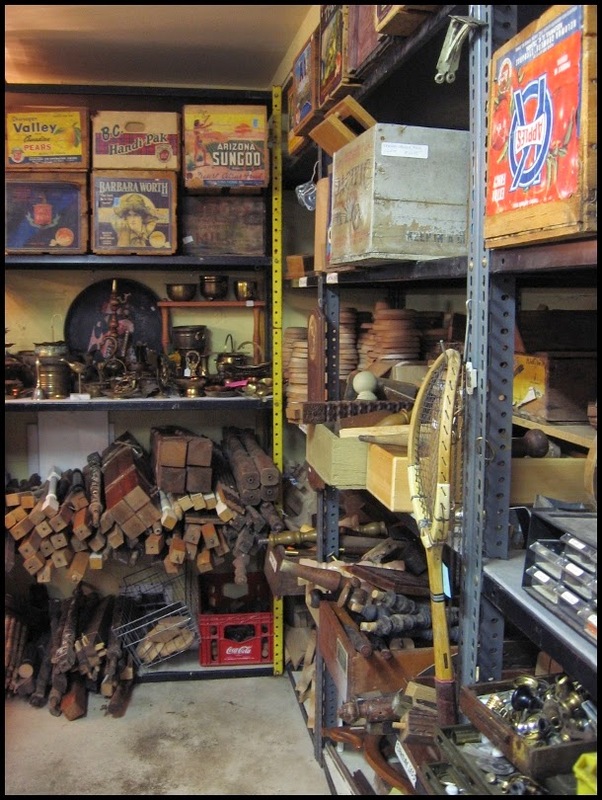 On the right hand side of this photo you can see some of those thin drawers that I mentioned earlier, filled with all kinds of treasures. 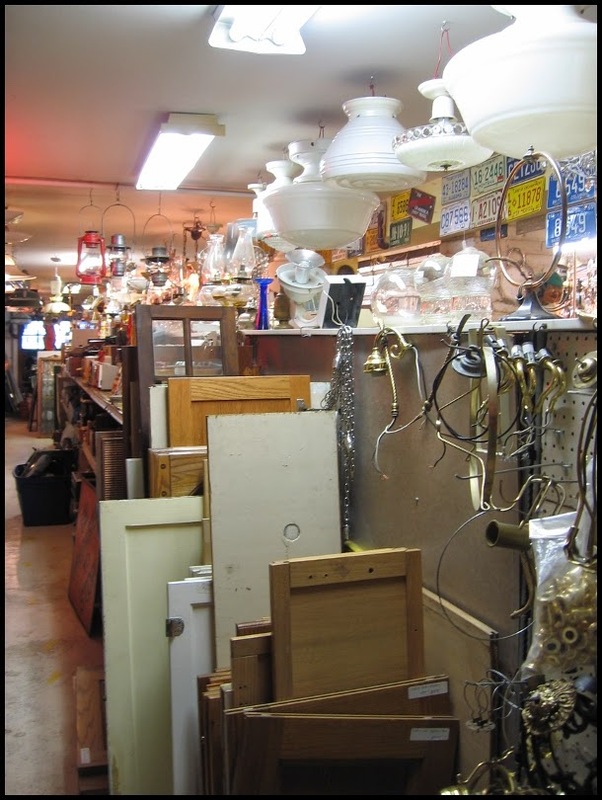 There are lots of cabinets and drawers filled with treasures all around the shop. 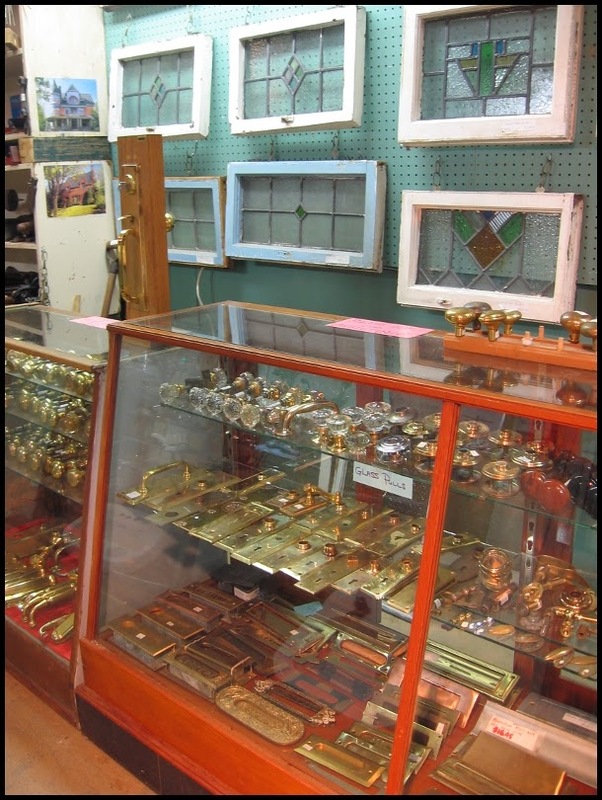 Here is a sample of antique door hardware. The etched designs on some of the old brass plates are quite beautiful. 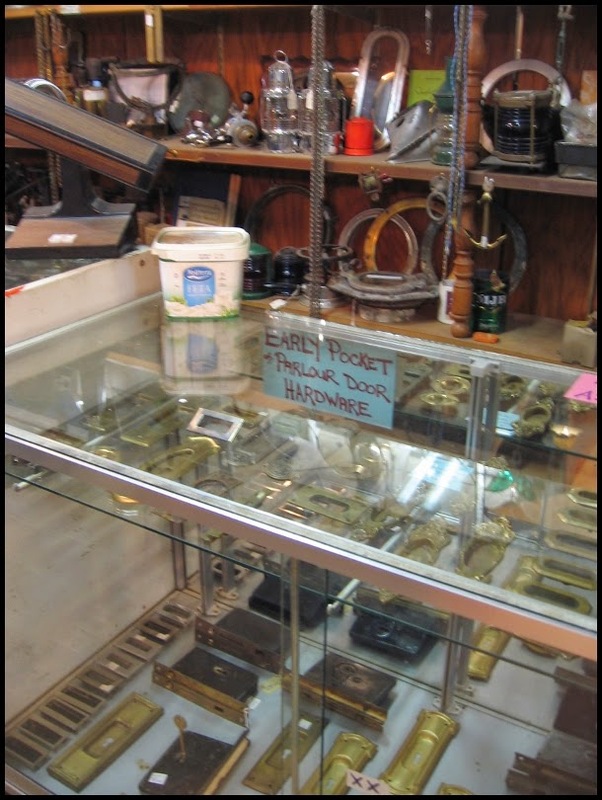 Here is another very old showcase filled with vintage glass door knobs, metal door knobs and a wide variety door hard ware. Some of the hardware could be framed and treated as art work. More glass shades and wall sconces as well as the metal bases for attaching the sconces to the wall. 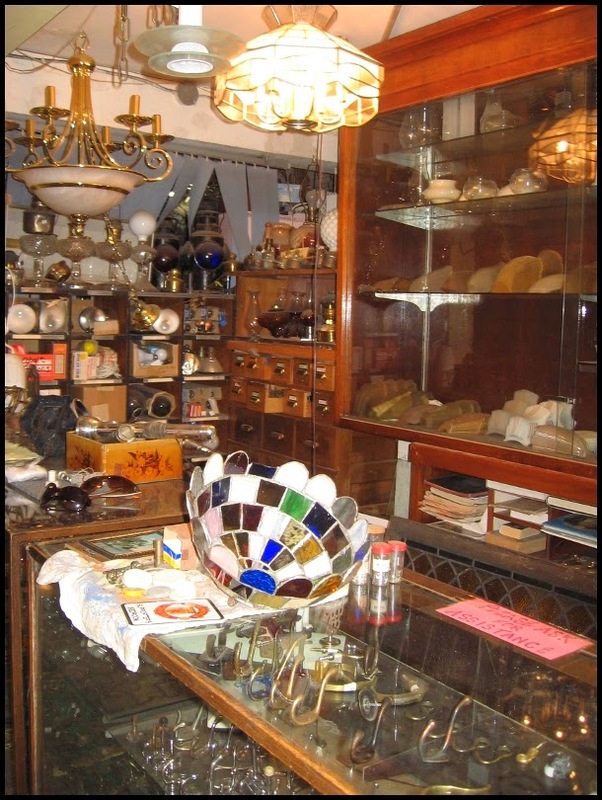 He has several glass cabinets filled with antique glass shades. I don't go into this area very much, it is mainly electrical parts. My son and I found a porcelain light bulb socket and a button light switch that he used to turn a brass light cage into a table lamp. I want that table lamp, he did a beautiful job. 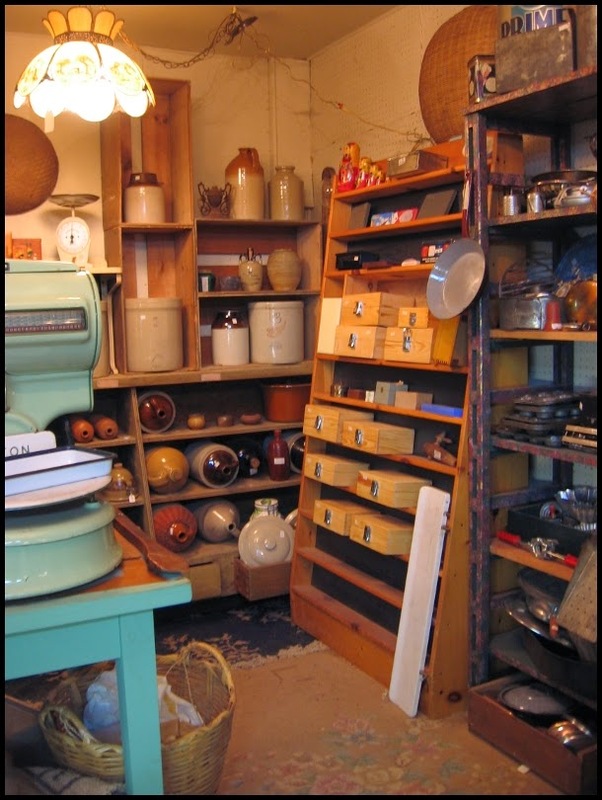 This photograph of a portion of the kitchen/household area has antique crockery, pastry molds and old scales. There are boxes and baskets of items to browse through. Here is another view of the kitchen/household area. The shelves on the wall have old bottles and tins of all sorts. 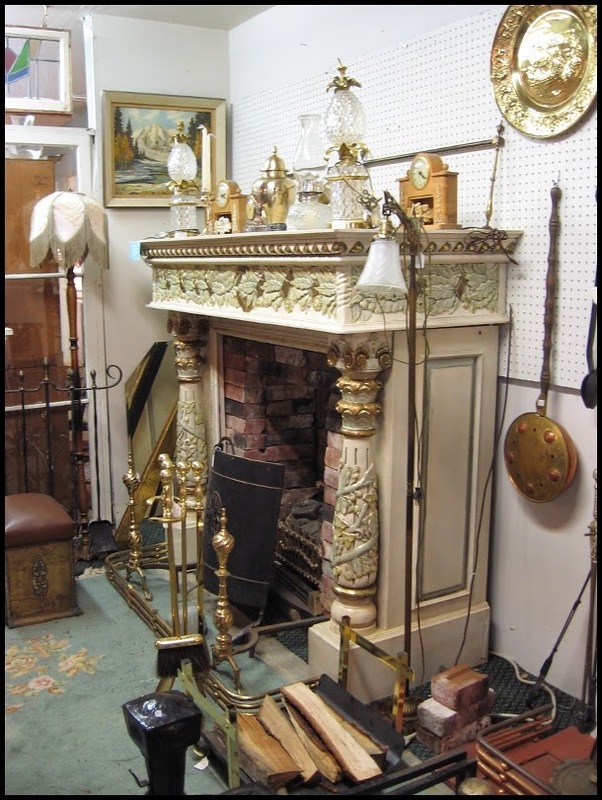 This old fireplace would be quite wonderful in a very contemporary shop. 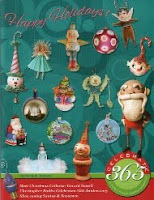 He has fireplace fenders, fireplace tongs, brushes and shovels of all sorts. There are tins, boxes, baskets, bottles and... stuff. The place is crammed with lots of very interesting STUFF! 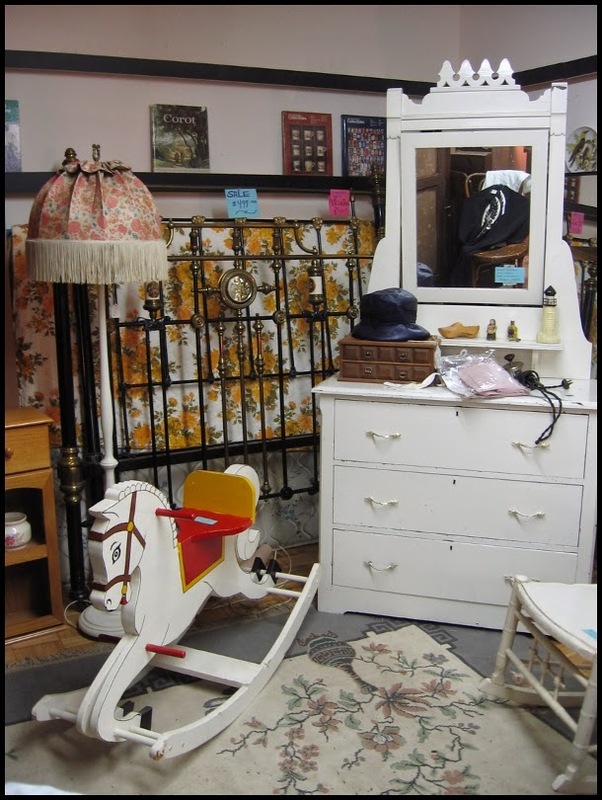 The bedroom/boudoir area has side tables, bed frames, lamps, and chairs of all sorts. 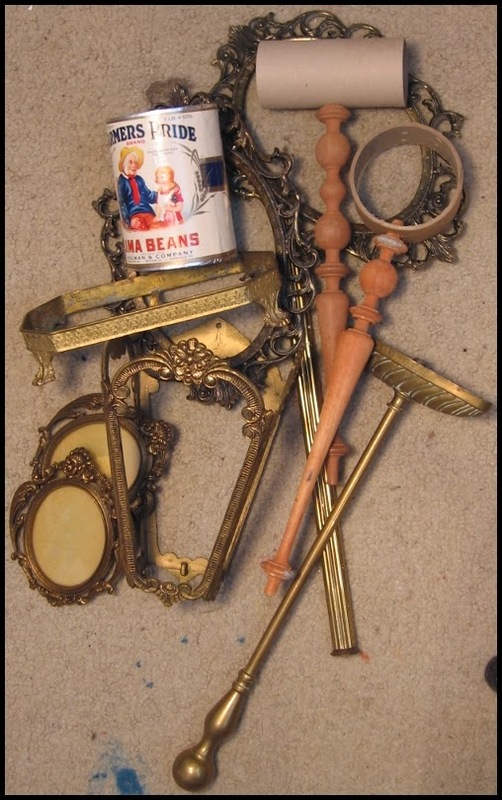 I think that I have said "of all sorts", "treasures", and "stuff" or something very similar quite a lot in this post. There is another area with disassembled metal bed frames in the shop. Now we are going out the back door and up the back walk to the less valuable and more weather proof merchandise. If you are interested in recreating a 1920's garden there is some galvanized wire fencing just behind that wood stove insert. 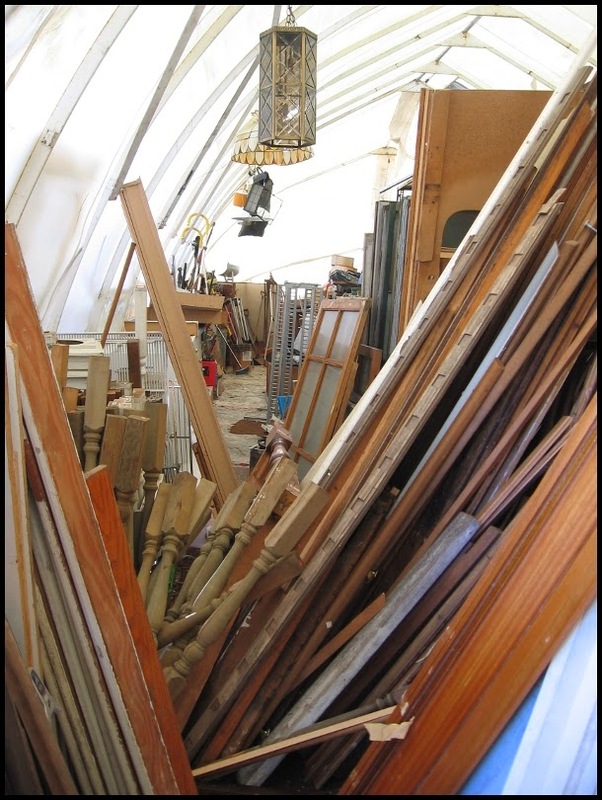 He has door frames, window frames with most of the glass in them, and a few farm implements. Inside the big arched tent like structure are doors and banister parts, and some interesting hanging lamps. 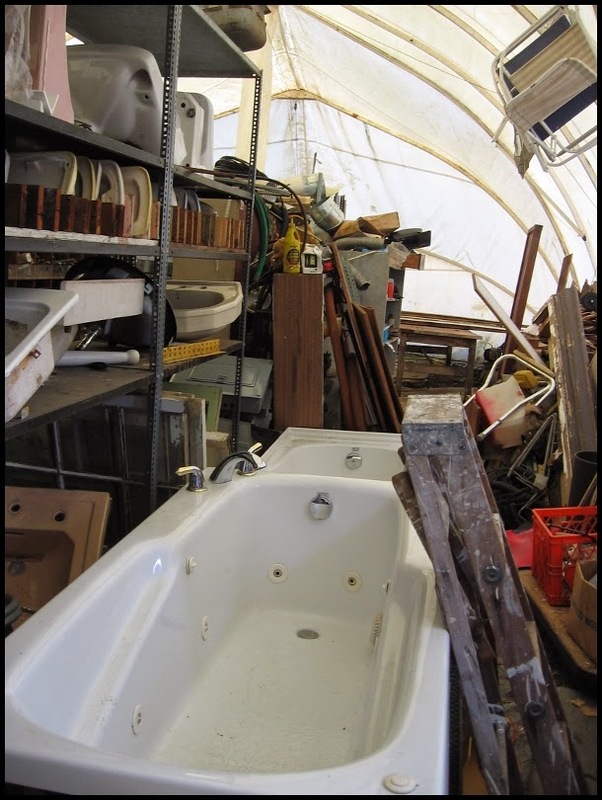 This section shows the variety of sinks, bathtubs, and faucets available. 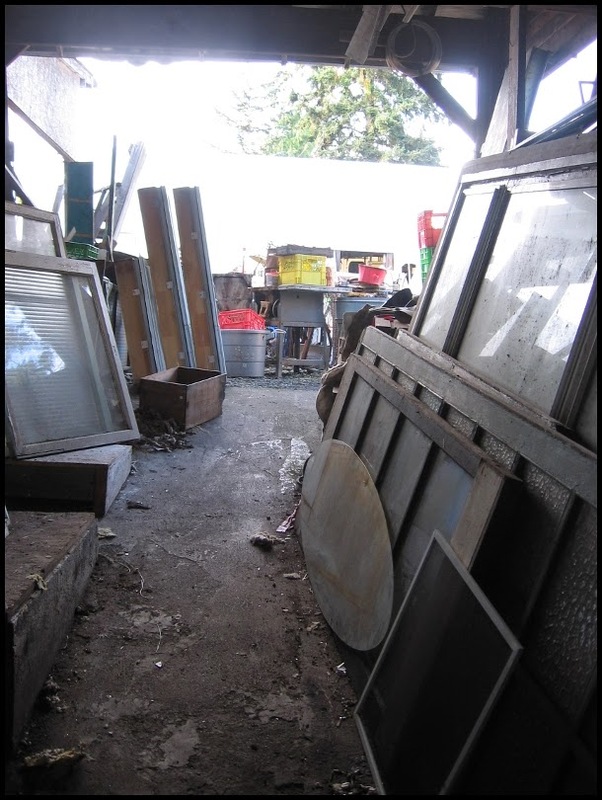 Here are more sinks, some medicine cabinets, mirrors, and farther down windows that are in better repair than the ones outside. 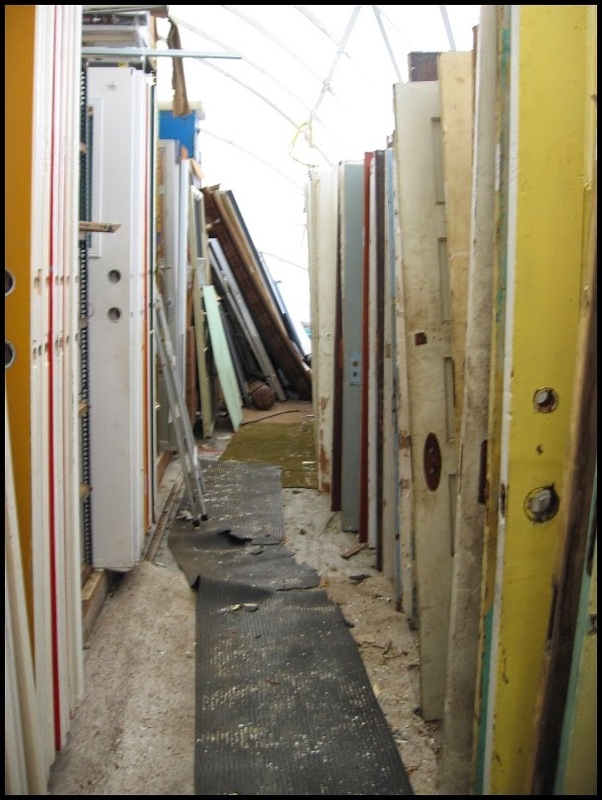 Rows of assorted solid wood doors all minus there hardware, you can purchase that inside. 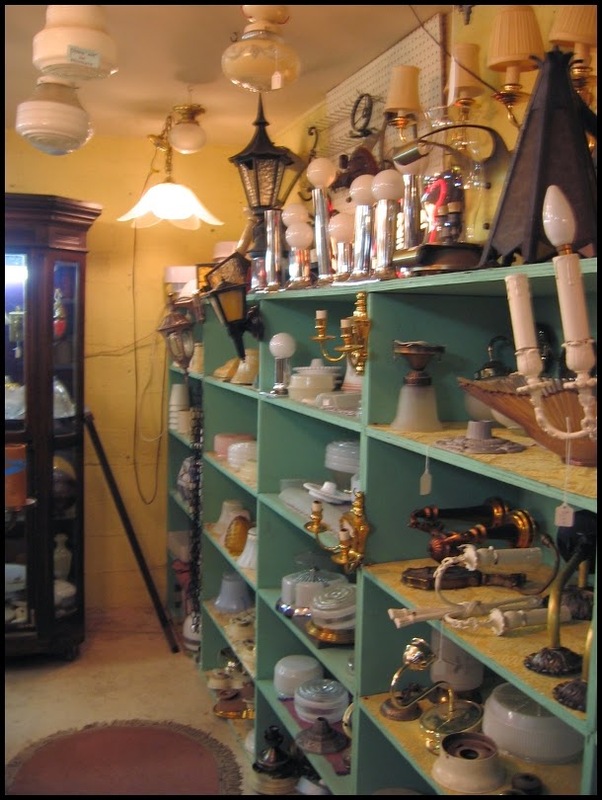 There are shelves of assorted vintage and not so vintage glass lamp shades. 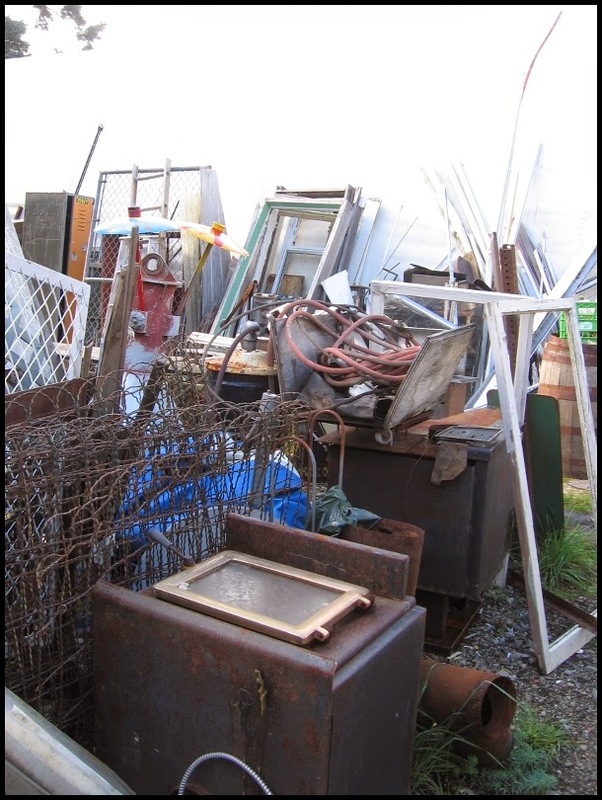 This last picture of the tented area shows assorted tools, windows, and even some old crates down at the very end. 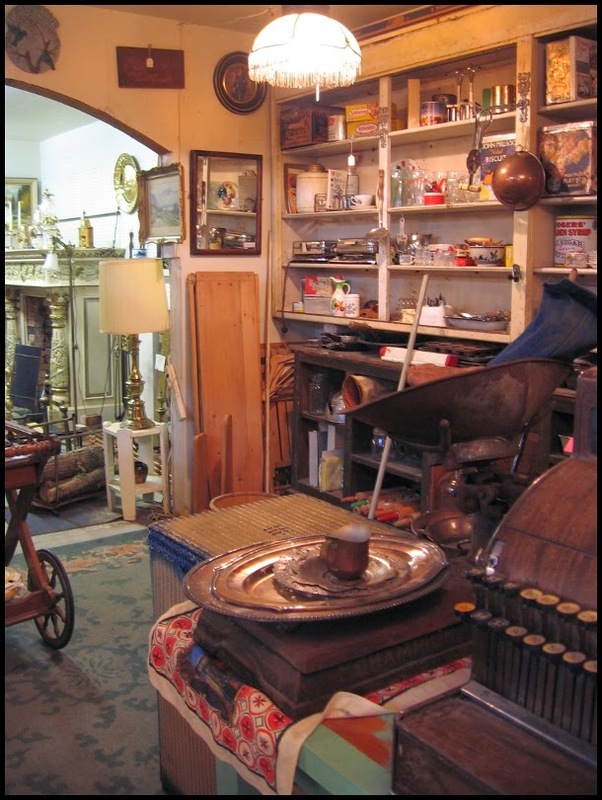 The upstairs shop called "Memories" as I said has antiques but the downstairs is filled the bits and pieces of daily living from bygone eras. I go there fairly often and love every minute of it. Ohh so much eye candy I would be in heaven!! Oh Wow! I totally agree with Lori, This place is Heaven!! So much to look at! So much to drool over! So much to want!! All you need is a house to go with it! What a fantastic place, there's nothing like that in London, we only have very expensive salvage shops and anyway our shops are a fraction the size of yours. Lucky, lucky you - I would LOVE to have a place like that to wander around in whenever I felt like it. Thanks so much for your comment on my William the Conqueror post - you always manage to find much better words than me to describe what I'm getting at! It is amazing to me that there are not shops like this in other areas. Am I just very fortunate that a place like this is in Victoria? Get there and scour your cities and let me know what you find. Oh my - I would be right at home here. People always laugh that I have a thing for rusty old tools. Ha! I left you a reply on my box blog...it's lengthy so I apologize for not repeating it. If you have time do stop by. I so appreciate your thoughtful comments. So nice when someone gets what you're doing, isn't it? That's not fair B... now I have to come clean and confess that I never finished cleaning my studio. Some of it is done, does that count? 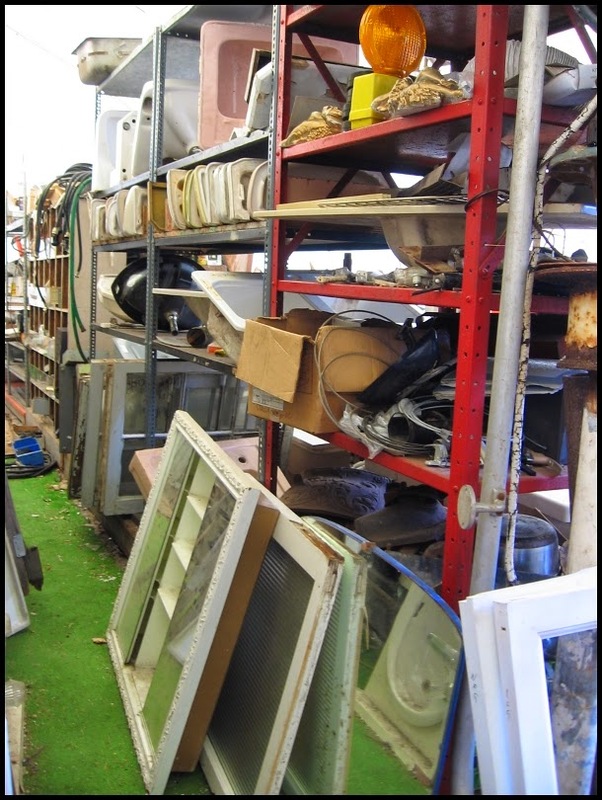 We have several in the Bay Area, Urban Ore is wonderful, Omega Salvage is nice but more expensive. Then there's always the infamous Alameda Point... easy to lose all your money there in one day! !